I suspect demand has been down this year for some reason and flights are well under-booked. There were only 25 passengers on my flight from Orlando to Manchester 3 days ago - bearing in mind that this is in the kids Easter holidays. Mind you, it was lovely to have 4 seats each to lie across and actually get to sleep for once! 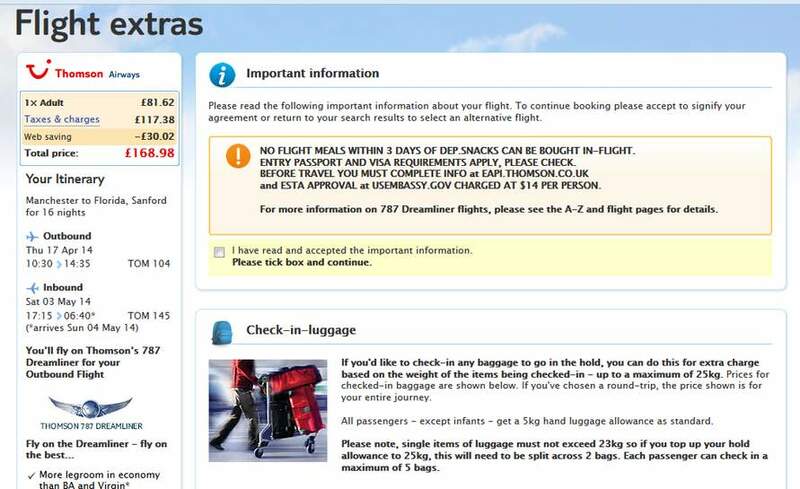 Just priced this thursday from BHX for 2 adults and 1 child, a ridiculous price of £506.94 !!!!!! link goes to sky scanner? Looked on thompson but cheapest is £210? Anything that comes back before 28th? Also do you know where last minute cruises, such as p&o, ones that sail from uk are sold? Why does my Girl friend work in a school I could have gone ! Get a new girlfriend ! Mind you....2 days notice doesn't leave alot of scope for packing, visa's, time off work/school. Hot. I'm hopefully heading out that way in June so this is right up my street. I suspect demand has been down this year for some reason and flights are … I suspect demand has been down this year for some reason and flights are well under-booked.There were only 25 passengers on my flight from Orlando to Manchester 3 days ago - bearing in mind that this is in the kids Easter holidays.Mind you, it was lovely to have 4 seats each to lie across and actually get to sleep for once! sorry guys I had to nip out to buy a new keyboard as it died on me, im pants with the laptop! How was the outbound flight? That was Orlando to Manchester. Manchester to Orlando was fairly full. Security at MCO was easy (5 minutes) - getting your baggage back was the hard part - it took 2 hours :(. Give me Sanford airport over Orlando International any day. 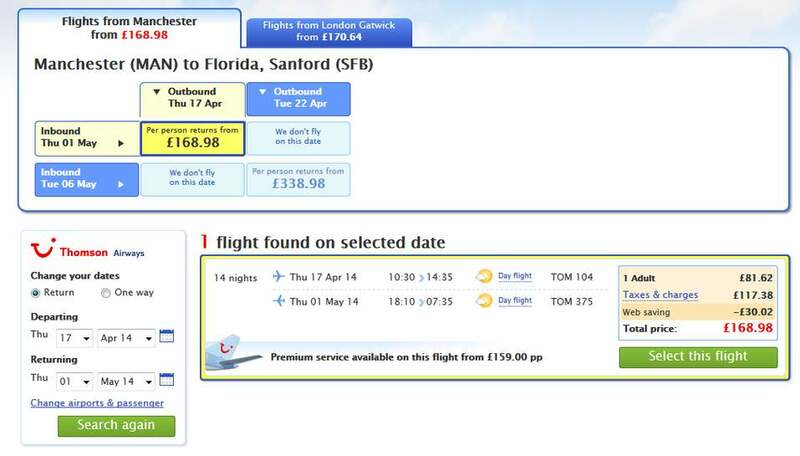 The guy I rented the villa from also suggested flying into Tampa from Gatwick with BA. Wow this is amazing...cheapest ever! 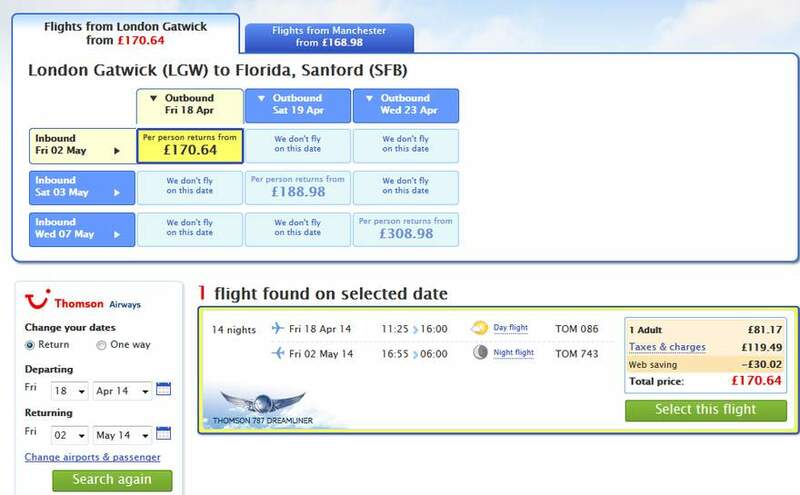 I cant find any flights this cheap???? Hi, stupid question as I virtually never go abroad but will be doing this year. When the flight is this cheap and this last minute how difficult is it to get accommodation at a decent price? Hi, stupid question as I virtually never go abroad but will be doing this … Hi, stupid question as I virtually never go abroad but will be doing this year. 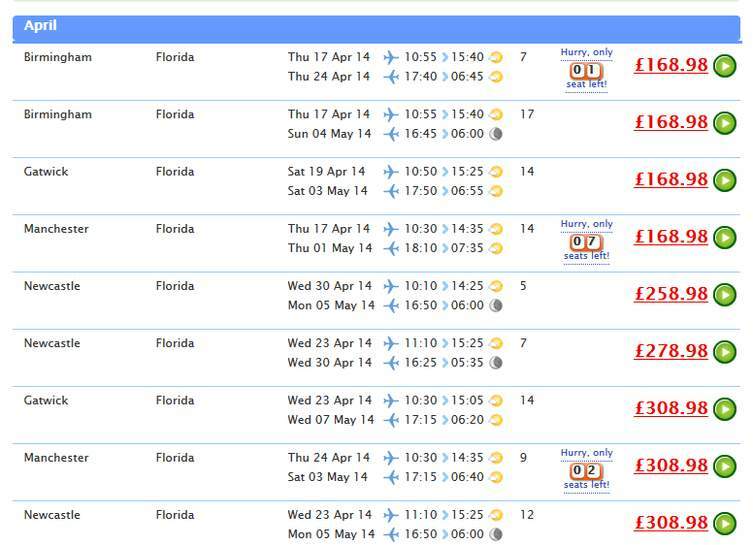 When the flight is this cheap and this last minute how difficult is it to get accommodation at a decent price? great prices....just hope theres these kinda prices next year when i plan … great prices....just hope theres these kinda prices next year when i plan to go....Mind you....2 days notice doesn't leave alot of scope for packing, visa's, time off work/school. Awesome hoping for something along these lines next month...once the blooming US embassy gives me my passport back! I... ahem... cocked up my little boys ESTA last month - went to print them out the day of our trip and couldn't recover his because I'd input the wrong demographic information. I had to re-apply (whilst simultaneously crapping myself and wondering if I should tell my wife) - needn't have worried, it was authorised immediately. But if you know roughly when you're going they last for 2 years anyway so just get one well in advance. However, the poster said visa rather than ESTA so I'm assuming they are not eligible for an ESTA. The poster I replied to said visa waiver which is ESTA obviously anyone with convictions/arrests for crimes of moral turpitude would not qualify and would have to apply for a VISA.